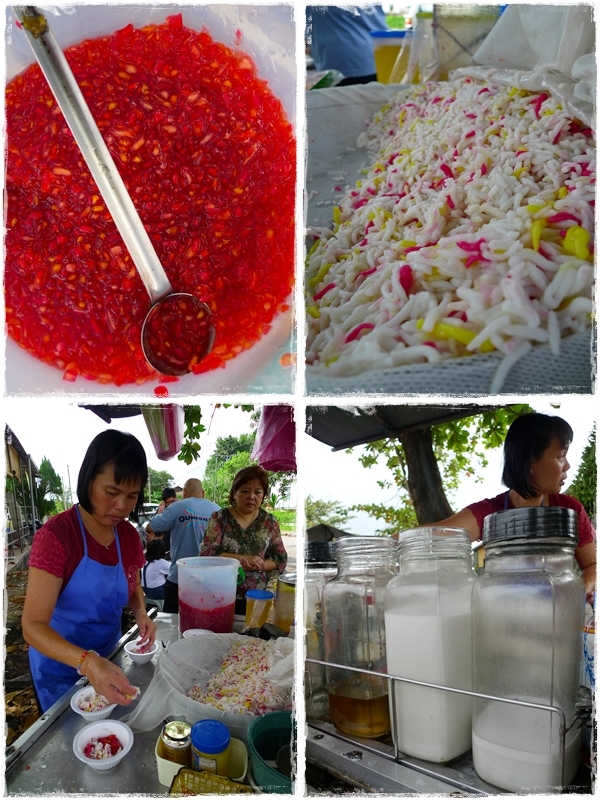 The Red Rubies (Sek Lau Ji), the Bee Tai Bak (the wriggly strands made from rice flour), and the condiments of coconut milk (santan) and syrup. Hence, I’ll share something which I have always been intending to, but somehow various distractions and barriers stopped me from doing so. Have you heard of “Sek Lau Zhi”, or “Bee Tai Bak”? In Malay, this bowl of refreshing dessert is called Ais Sagu. In all of Ipoh, and even all throughout the many decades of my life (remember, I am from the Jurassic age okay? ), I have only tried this particular version at a pushcart stall at the corner of Jalan Prince and Jalan Pasir Pinji in Pasir Pinji of Ipoh. Since I was a toddler, really. And since moving away from Pasir Puteh, I hardly returned to this Chinese-populated area, unless for some Big Tree Foot’s goodies aka Fried Liew, or Poh Lee Fried Chicken. Passing by one evening, while on the way to Peng Tau for dinner, my eyes set sight on this stall, a most heart-warming sensation overwhelmed me. For it has been many, many years since I have relished and longed for that same old bowl of heavenly sweetness. I thought somehow this tradition has been lost with time, paving the way for the more common Ais Kacang (or ABC aka Ais Batu Campur), Cendol, and such. But to be able to witness the crowd standing around this simple, unassuming stall at a corner of a junction, happily tucking into their bowls of Ais Sagu? Priceless. The stall is currently owned and run by the daughter of the original proprietor, whom in turn has been running his stall since the 70’s. The daughter’s name is Ah Ngan, and she only operates on weekends and public holidays, from 1-6pm only. Very short and exclusive time frame, hence be there early to avoid disappointment, as she may closes early once sold off. Tastewise? Nothing mind-blowing, unlike those Durian Cendol, or even those vibrantly-colourful Mixed Fruit Ice. 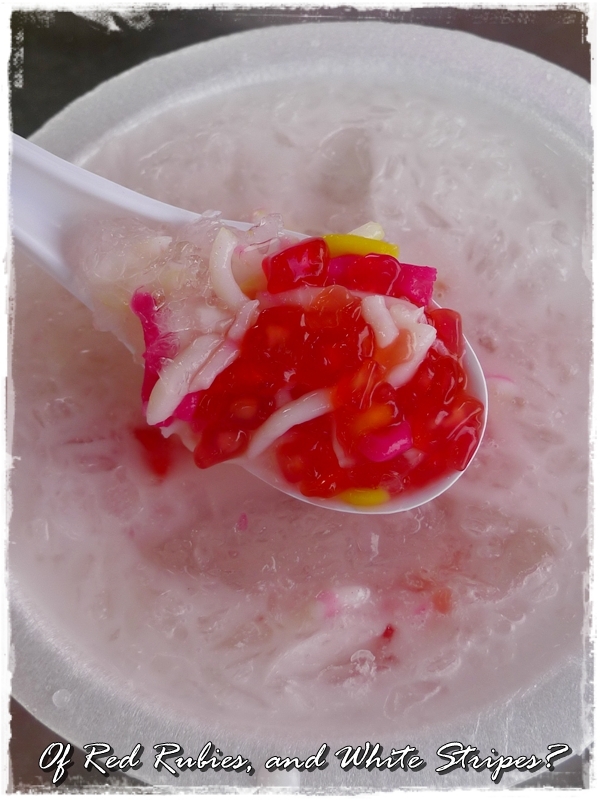 But the sheer authenticity of it all, and the perfect requiem for the scorching weather; The shaved ice concoction flavoured with sugar syrup and coconut milk, with chewy bites offered by the red rubies (sek lau zhi, made from tapioca flour and they’re not ‘sagu’/Sago) and strands of ‘bee tai bak’ (made from rice flour with artificial colourings) render the experience a most satisfying one. Those staying in Pasir Puteh/Pasir Pinji or at least grew up in the area must be familiar with this stall. Back then, when Ah Ngan’s father was peddling around the residential area, he used to shout “Kickapoo! Kickapoo!” and “Bee Tai Bak! !” to attract the crowd. We did not require blaring horns, fanciful music nor neon spotlights back then. Those fond memories …….. Opens from 1pm – 6pm on WEEKENDS and PUBLIC HOLIDAYS ONLY. And here’s a GOOGLE MAP to the Ais Sagu stall. 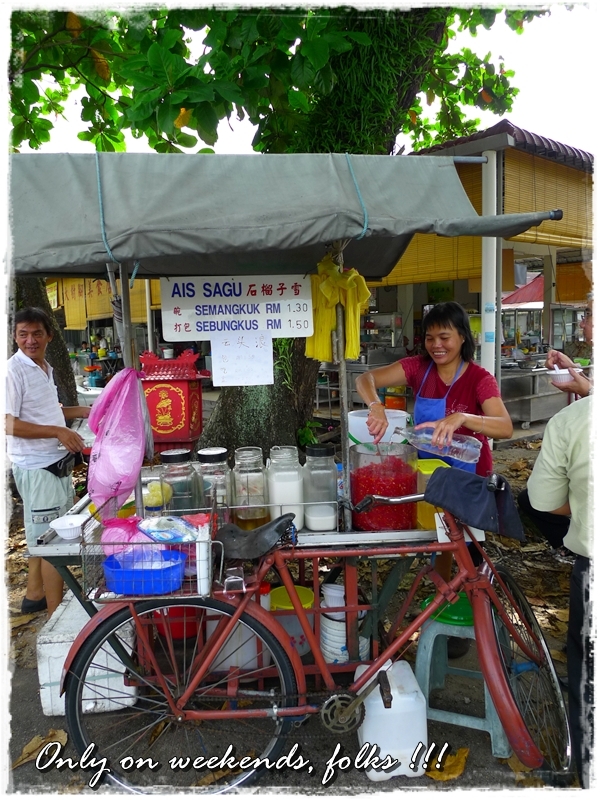 A traditional dessert that is probably never heard of, by the younger generations, Ais Sagu, or Sek Lau Zhi is sold by this very same pushcart stall in Pasir Pinji of Ipoh. Refreshing, classic, and very addictive…. Don’t worry lah, sure got chance one. Hahahaha, not like this stall’s gonna run away or something. phew, nice to hear u made a speedy recovery! Yes, and the sheer pleasure from spooning those goodness into one’s mouth while standing around the stall, in a cheery banter with the other patrons and Ah Ngan herself, makes it all worthwhile. This Sek Lau Zhi is a forgotten dessert for many and its nice seeing it in your blog. Great find, James. Thanks CK. I was ecstatic once I saw this stall still running at full speed one fine evening. No doubt the ONLY one in Ipoh, if I’m not mistaken. I’ve never tasted ais sagu before. Looks good! sek lau zhi,!! I love this! Only had it once when it was made by a friend’s mum in penang. (she passed awy be4 i could learn the recipe from her) And this can’t be found in Pg either! I really need a trip to Ipoh soon man! Very hard to find this anywhere else. But some dessert outlets, those modern ones, already start to incorporate the rubies into the desserts, but they’re different from the Thai style Thab Thim Krob, in case anyone’s wondering. i’m staying in Pasir Putih, ipoh n now working in KL. i tot Bee Tai Bak is a lost tradition trade oredi. Ah Pek use 2 push his tricycle around my housing estate, jln chung ah ming. I use 2 hv a bowl on d spot 2 quench my thirst after school n “ta pow” 4 later in d afternoon 2 “enjoy d rubies” blissfully. TQ James. I also thought so. I told my friends about Bee Tai Bak, and all of them came back with blank stares. I was frustrated, for I myself have not been eating them since I was in my toddler years. You’re most welcomed. Glad to see some Pasir Pinji/Pasir Puteh’s originals replying here. By the way, what’s your surname again…? You share the same surname as my mom, James. Aiks! scary ….. *_* Hahahahha …. nice to know you then. I also remember this back in those days. So old liao me … sigh …. this one is quite special as they add in the Sek Lau Zhi. Hehehe, nice movie hor?!! Hahahah .. i was lying dead-fish on the couch all day. So caught some good movies, dramas etc. Wow..have not taken this for a long long time and this look authentic . Didn’t know you had food poisoning. Here is me and the Piggies wishing you speedy recovery and a Blessed and Happy New Year ! Thanks Elin. This may come a little late though. I recovered well after the new year, slept for a good 10 hours or so, from NY eve til NY morning. Wait, did that make me sleeping THROUGH the year?! In Pg, rat tail noodles is called bee-tai-bak . This dessert in definitely new to me. Interesting. ai yo.. look at the santan!?! very high cholestrol lor! About the Bee Tai Bak..my father always go there and buy..
hey! glad to hear that you’re feeling much better! i know what you mean about the sight of food being revolting to someone suffering from diarrhea. i felt exactly the same when i was down with food poisoning a couple of months back due to some fishy otak-otak! similar to Thai dessert red ruby? the ruby made from tapioca flour only without water chestnut in it? Your must careful eathing out side food!I miss ipoh food ! Hi ah mai, glad to see you here. I will be careful next time. This stall is near to our old house in Pasir Puteh. A dessert that is alien to me. tat would be life, to work on weekends only! Hehehe …. she IS working another job on weekdays. This is like … a part time of sorts. You get well soon ok! I know how terrible it is eating oats the whole day. Yuck! But you can really lose some weight from there! (I’m sure you don’t need to, but I’m just saying. :P) Happy New Year! .-= iamthewitch´s last blog ..Crystal Jade La Mian Xiao Long Bau =-. This is definitely new to me. I’ve nvr seen this dessert before. Great post! .-= kyh´s last blog ..Off to Bunaken =-. eh? i didnt know its sold at the stalls too! i thought it is only in thai restaurant! hi xin, this is different from the Thai style of Thab Thim Krob, made entirely without the water chestnut/crunchy centre. This is something very new to me! Looks very refreshing and cooling. Hey rest more and take good care! Prepare for the new year party! Happy New Year! The last time I had it was the last century. LAST century?!!! LOL. Yeah, ‘right’ …. But anyway, they’re still there. So go have a bowl before they really really extinct. It’s rare to find authentic or original food nowadays.A great effort to highlight this almost forgotten dessert which is hardly known among the modern generation. Thanks Jun Yee. Just wish she will pass this tradition down to the next generation then. Yes, I remember the calling of the man, ‘Bee Tia Bak’, when I used to visit my grandma in Pasar Pinji 30s years ago, ahhh! … bring back so much memories ……. Yeahloh! And you know what? When I told my friends about this Bee Tai Bak dessert, they had those blank looks on their faces. Khek hei …..
i love this stall since i was 8 years old… now im 45 .. when his father time ,, the stall was move around at town … 1 of the street is call JALAN YANG KALSOM… must try….. I missed “Bee Tai Bak” i had it since I was a small FAT Ipoh boy.. Gotta make a list of foods to eat when I go back home next year.. Fat small boy?! Haha … yeah, that’s me back then. When we used to go for the sek lau zhi, the fried yong liew at underneat the shack, and the Poh Lee fried chicken. 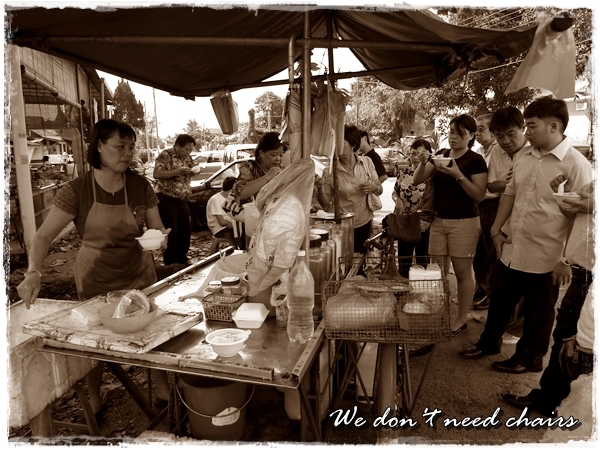 It is a must patronizing this Sek Lau Chi stall every weekend for my entire family.. I think this stall is the one and only one in Malaysia that sell such iced drinks. Try the 4-in one recipe of Sek Lau Chee, Wan Tou Long (Yellow Jelly), lime and sour plum. Just order this recipe and you will not regret. The traditional recipe of Mi Tai Mak and Sek Lau Chi is tremendously good. Oh, yeah loh …. Never tried her Wan Tau Long though. Wan Tau Long used to be my favourite, the stall opposite the secondary school SMK Pasir Putih. I learned more interesting things on this fat loss issue. 1 issue is that good nutrition is highly vital when dieting. A tremendous reduction in bad foods, sugary food items, fried foods, sugary foods, beef, and white-colored flour products could be necessary. Possessing wastes bloodsuckers, and toxic compounds may prevent desired goals for losing fat. While specific drugs temporarily solve the situation, the terrible side effects are usually not worth it, and so they never provide more than a momentary solution. It can be a known undeniable fact that 95% of fad diets fail. Thanks for sharing your notions on this web site. There was a new addition besides kickapoo she told me its “fing tow (something)” the yellow jelly plus adam boi and lime juice with shave ice. My verdict better than the 2 uncle selling cendol along padang kilat same street with famous uncle cendol padang kilat. I remember liao called fing tow long or wan tow long. I used to live in Kampar Garden in the 1970s which is just next to Pasir Pinji. That Uncle whose “loudspeaker voice” jeering something like “kin cheow per” can be heard from a distance as he ride his cart pass through my house in the afternoons. As a 14 year old, whenever i have some money in my pocket, I always run to his stall for a good servings of his special ice drink.! She now opens to 7 pm, and closes for a month web Chinese new year comes. Thanks Alex for the information.